CONDITIONS OF SALE: It has to be exhibited free of charge between 4 July and 1 October each year. STORY: Many people feel that the "Age of America" is coming to an end in the 21st century, as we are watching rises of new powers in unusual places. 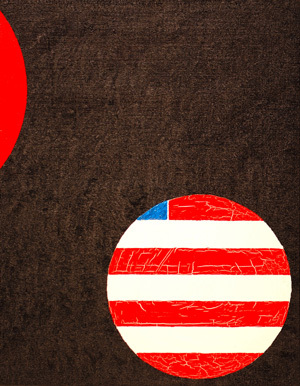 American global dominance is represented by fragments of its flag wrapped around the globe, while the new planet is just coming into the frame in the upper-left corner. Note the differences in quality of the red colour between the new and old "planets". The latter one was done with a technique called "lean-on-fat", where subsequent layers of oil paint contain less and less linseed oil, causing the top layer to crack. One of the pivotal moments of the American downfall and a possible identity of the new world leader are suggested through the price and preferred buyer identity. Relatively small size of this canvas also speaks about the ephemeral nature of power.